Four young teenagers meet and become fast friends at boarding school…. But this is no Hogwarts: the Wellington school is an Indian boarding school [in the 1950s], and its students have been forcibly enrolled, taken from their Indian communities across the country. We meet new students Lucy Secondchief, Simon Lone Fight, Noah Boyscout, and Elijah High Horse at their homes and follow their parallel journeys via train and bus to the school, where a sign informs them of the school’s most important rule: “English Only.” Simon’s breaking of this rule later in the narrative provides the book’s central dramatic episode as the boy refuses to forswear his language and is left handcuffed in a basement as punishment, sparking rebellion by the other students who surreptitiously visit and feed him. Almost all of the chapters function as stand-alone stories, with some focusing on one student or another while others bring the four together. Throughout, Smelcer’s anger about these stolen children is apparent but controlled, and he provides a well-judged balance of horror and hope, with the friendship among his protagonists giving the book heart and an opening to empathy. 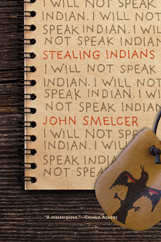 John Smelcer is the author of fifty books. His books of mythology include Trickster, The Raven and the Totem (introduced by Joseph Campbell), and A Cycle of Myths. In 1994, he co-edited the acclaimed anthology Durable Breath: Contemporary Native American Poetry. His writing has appeared in over 400 magazines and journals worldwide, including in The Atlantic. The son of an Alaska Native father, John served as executive director of his tribe’s Heritage Foundation, compiling and editing The Ahtna Noun Dictionary and Pronunciation Guide (forewords by Noam Chomsky and Steven Pinker). He is now the last living tribal member who can read, write, and speak Ahtna. For four years he served as the director of Chenega Native Corporation’s Language and Cultural Preservation Project, working with elders to compile The Alutiiq Noun Dictionary and Pronunciation Guide (foreword by H. H. The Dalai Lama) and editing The Day That Cries Forever and We are the Land, We are the Sea. In 1999, Ahtna Chief Harry Johns designated John a Traditional Culture Bearer, awarding him the necklaces of the late Chief Jim McKinley. That same year, John was nominated for the Alaska Governor’s Award for his preservation of Alaska Native languages and cultures. The Trap, John’s first novel, received the James Jones Prize for the First Novel and was named a Notable Book by the American Library Association and the New York Public Library. The novels The Trap and Edge of Nowhere were both published in the UK and the U.S., and Lone Wolves was included on the American Library Association’s Amelia Bloomer list as one of the best feminist books for young readers in 2013.